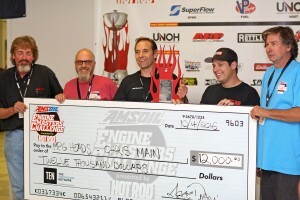 Engine Masters Champs – AGAIN! 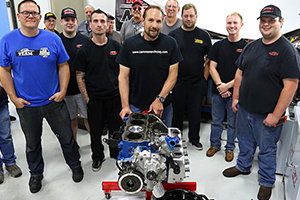 Oct. 8, 2018 — Scott Main of Cam Research/MPG Heads won the Traditional Muscle Class at the 2018 Engine Masters Challenge with a 405 cubic-inch Cleveland-headed Windsor Ford. This engine was first in his class to run Engine Masters Challenge, a week-long event held at presenting sponsor JE Pistons’ headquarters in Mentor, Ohio. Posting peak numbers of 570 HP and 549 lb-ft of torque, the engine had to undergo a thorough teardown and inspection, which included cc’ing a randomly-chosen combustion chamber and piston crown. All factors checked out within spec, and Main was crowned the winner. View the full story. Oct. 6, 2016 — FIRST PLACE! Cam Research smoked the competition and notched the top finish in the 2016 Amsoil Engine Masters Challenge on Oct. 4 at the University of Northwestern Ohio. Scott Main’s 404-inch, Cleveland-headed, small-block Ford averaged 578.8 lb-ft and 606.3 horsepower between 3,500 and 7,500rpm, with a peak power of 756hp, earning a 2926 score and the first place finish in the small-block category. View the entire article from Hot Rod magazine here, or watch the video coverage. Oct. 25, 2013 – What a season! Powered by a stout 850 hp Boss 429, the ’67 fastback was back on the track this summer. Plenty of wins, textbook burnouts, a finals appearance and one perfect light were all just part of the excitement. Click on the video for some highlights from the last couple of events this fall! Cam King video now live! Oct. 11, 2013 – For all those wondering what a Cam King is and how it works – Cam Research is pleased to announce the new Cam King video! Get a first-hand look as we go through the entire setup and break in stages. Each flat tappet cam is pre-lubed and run through a 30 minute break in session. Lifters are numbered, the cam is cleaned, bagged and shipped directly to your door. Best of all – no more break in worries when you start your new engine. All that for just $60.00! Oct. 4, 2013 – Better late than never. After years of delaying the inevitable, Cam Research is trying its luck in the social media world. Visit our Facebook page at: www.facebook.com/camresearch. We will be adding as much content as possible to keep customers up to date on new products, dyno runs, tech tips and trips to the track. Most importantly we want to feature YOUR car, truck or boat. Got a Cam Research cam? Send us a photo and tell us about it! We’ll post it on our website and show it off on the facebook page. 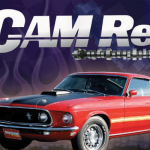 Aug. 2, 2013 – Scott Main, founder of Cam Research put the new Boss 429 to the test Friday night, posting a time-trial best time of 10.33 @ 131.75 mph and advancing to the finals at Club Clash hosted by Bandimere Speedway (elev. 5800′ above sea level). Friday marked the first time the Boss powered ’67 Fastback hit the track this year, following some impressive pulls on the shop dyno. Gobs of power from the hemi head Boss and consistent driving spelled trouble for Club Clash competitors as, Scott sped through four rounds before the evening came to an end in the finals. Check out the video of another great evening at the drag strip and stay tuned for more great videos as we put the Boss through its paces this summer.